Lay out 3 slices of bread and spread them with mayo. Alternately, you may spread mustard on the first slice of bread (the chicken side of the sandwich). Lay chicken slices on the first slice of bread (we like to put lettuce on top of the chicken). Lay second slice of bread, mayonnaise down, on the chicken (and lettuce) layer. Spread mayonnaise on the top side of the second piece of bread. Lay lettuce on top of the bacon. Lay tomato slices on top of the lettuce and pepper them to taste. Close the sandwich with the last slice of bread - mayonnaise down. Pin the 4 sides of the sandwich (not on the corners) with the toothpicks and, cutting from corner-to-corner, cut the sandwich into four triangles. Want the total experience? Do it all! ... also known as the "Club Sandwich" or the "Double-Decker Sandwich", (and sometimes as a "Triple-Decker Club Sandwich - although this is, actually, a misnomer as the Triple-Decker would have four slices of bread) this big sandwich is a real treat! The shortest possible description: "A BLT stacked on top of a chicken sandwich - sharing the middle slice of bread." The whole story: Some will toast it - some won't. Some will use mustard - some won't. Some will use mayonnaise - some won't. Some will butter the bread - some won't. Some will use cheese - some won't. There is the Friday Club Sandwich (we haven't figured out precisely what that is), the California Club Sandwich (any triple-decker with avocado, it seems) ... it's getting confusing! We prefer (what we believe to be) the traditional - a simple Club Sandwich prepared with Chicken (could be boiled, bar-b-qued, rotisseried [broiled on a rotating spit], roasted ... or prepared any way you prefer) or turkey. Some even use cold-cut style processed chicken or turkey loaf - others will not. Still some use beef or pork. We still think this is a chicken or turkey sandwich all mayo (and we will sometimes substitute mayo with mustard on the first slice) - stacked under a BLT. Using our bacon substitutes, this falls into the kosher/hallal style of foods ... and can be made kosher or hallal through the purchase of appropriate, available products. We use bacon styled turkey or chicken product. A vegetarian might choose to use a combination of seitan and tofu products as texture and flavour substitutes. A vegan might use a hummus spread - very light in garlic ... or a thin spread of baba ganoush in place of mayonnaise. We have not, yet, tried such sandwich combinations. Break rules - have fun with your sandwich. After all, it's yours, not ours! Even if "we" don't think it a "club sandwich", you may find the next, great, "Double-Decker"! This is our preferred "traditional clubhouse" sandwich. With a plate of slaw, some fries and a quarter or even a half of a sour dill pickle - that's a traditional, deli-prepared "Club Sandwich" [described in a menu as] A double-decker or triple-decker sandwich with chicken, bacon, lettuce and tomato. Restaurants serving the Jewish community simply dropped the bacon - sometimes varying the name. At a point, every double- or triple-decker combo, including an "egg" variation, became a club sandwich. So? 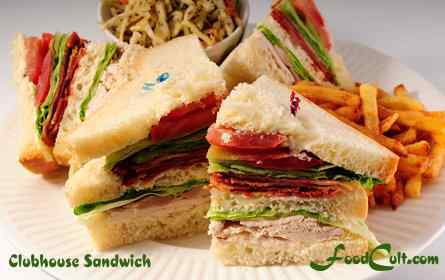 Make your own "club sandwich" history - but don't forget to enjoy our traditional preparation too! Do you LOVE the sandwich? Get it as a wallpaper for your display @ WallpaperOriginals.com!